Barcelona in 48 (and a bit) hours! “Mes Que un Club”. It’s about time the people of Barcelona took the motto worn by their world renowned football team, which translates to “Not just a club”, and opened it out to the entire city. Barcelona really is not just a city. 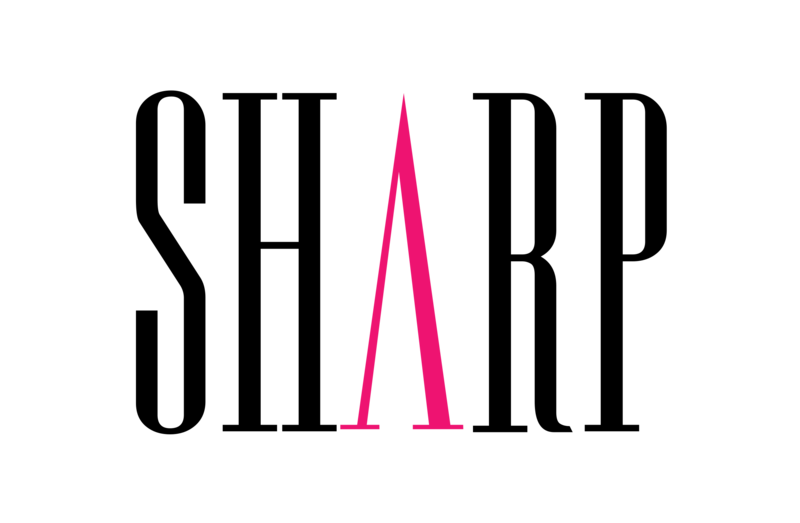 It’s a beautiful concoction of modern culture and history that blends classic architecture with boutique designer outlets. Fantastically cultural days flow into equally lively evenings, and all on a breathtaking canvas that stretches from the mountains down to the sea. With such a wealth of experiences on offer it would be wise to think you wouldn’t scratch the surface of Barcelona in a weekend, but if you do it right you can leave after 48 hours feeling as if you’ve truly experienced the Catalonian capital’s culture. Or at least dug your nails in a little further than expected. I went in January with my girlfriend as a post-new year pick me up. She’s great at finding deals and with a mixture of perseverance and luck we stumbled across the perfect hotel that really put us within touching distance of the centre. Ideal if you’re looking to explore, Hotel Europark has a distinctly boutique feel that is undersold by it’s very reasonable price (particularly if you pick up a deal on lastminute.com like we did). The rooms are clean, comfortable and modern with everything you need for the weekend. Head to the roof terrace and you’ll also find a pool should you happen to be staying during the summer. I chose to sit that one out this time. It sits on Carrer d’Aragó, which is a mere 5 minute walk to Passeig De Gràcia, a street boasting some of former resident Gaudi’s most striking architectural work in the form of the Casa De Batiló, as well as a whole host of designer outlets. You can marvel at Gaudi’s magnificent dragon roof, then marvel at the price tags on the Tiffany rings directly opposite! It’s also a stones throw from the Passeig De Gracia Metro station which is accessible directly from Terminal 2B at the airport on line R2. It’s €4.20 per person and takes about 25 minutes to get into the city. Head the other way from Hotel Europark and within 10 minutes you can reach one of Gaudi’s other incredible masterpieces, the as yet unfinished Sagrada De Família. Much like the decoration of my spare room, the work continues with the vague hope that it will eventually be finished. They are planning to complete in 2026 but the Spanish way of life has this beautiful way of taking that little longer. The same excuse can not be used for my spare room, although I doubt anyone will be including it on a tour bus route anytime soon. I will come back to tourist buses in a moment because, while many people choose to stay away and do it themselves, we chose to use them and found they gave us a great feel for the city. Walking is a must though in Barcelona. Only that way will you stumble across tiny tapas restaurants, hidden squares, and meet some of the great people around the city. Whenever I give you an estimated walking time bear in mind this was often extended by a stop at a tapas restaurant. Or two. Don’t bother with meals at your hotel. There is so much beautiful food on offer you can pick up something whenever and wherever you are. If you happen to end up staying in Hotel Europark, or even the Eixample district make sure to give the family run La Particcela a visit for breakfast. We sat in the sun and enjoyed a simple yet filling breakfast before heading off on our travels each day. 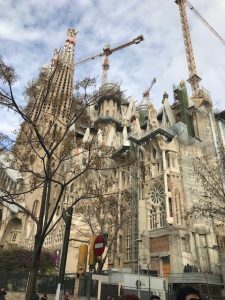 Having arrived on Friday night, and after sampling a couple of tapas restaurants near the hotel (we got one recommendation from reception before finding another on our wanders as you do), we decided to kick off our sight-seeing the next morning at the Sagrada Família. As you stand and marvel at Gaudi’s unfinished masterpiece it’s easy to see why he became so wrapped up in the structure that he called it home for the final part of his life. After tearing ourselves away we grabbed the Hop on Hop Off bus to take in as much of the city as possible. As they do in every city the buses let you get a real feel for the place without holding you captive for hours on end. It has two routes, orange and green, and you’re looking at 30€ for a single day or 40€ for two. We chose a two day pass and scooted off on the green route back into the city centre. This took us past the famous Parque Güell and, while we elected not to disembark, we will certainly be giving it a look next time we go. We arrived at Casa Batiló and decided to jump off and walk down the beautiful wide and picturesque Passeig De Gràcia. 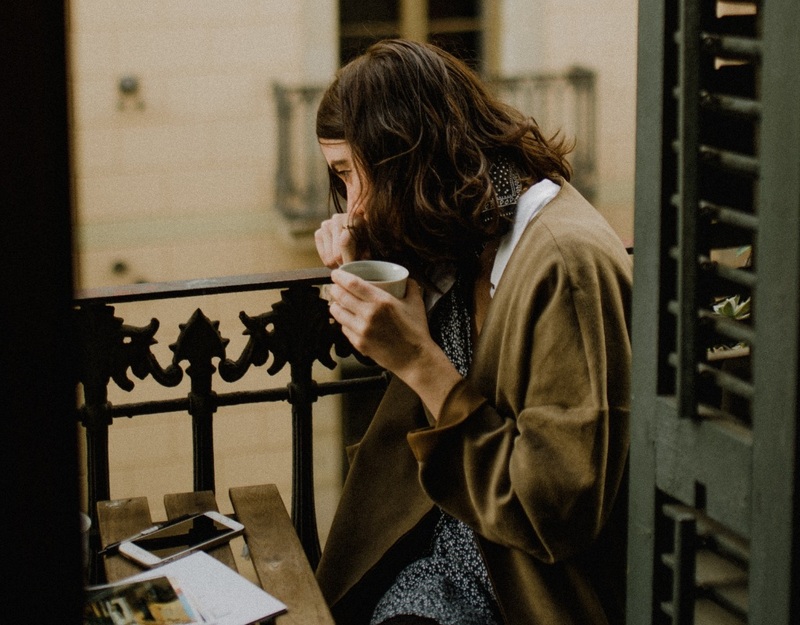 5 minutes will bring you to the central square, or Plaça de Catalunya, a gathering place for many locals and a great place to watch the world go by. From here you merely cross the road and you’re on La Rambla. Barcelona’s most famous street, and a MUST for any visitor, is a tree lined pedestrian stretch of people, kiosks, entertainment, shops, markets that sell cones of delicious spanish cheese and ham (you won’t regret getting one! ), restaurants, and more people that continues for almost a mile. It is the heartbeat of the city and demands a visit during both the day and night if you have time. La Rambla is also the divide between the quarters of El Raval and Barri Gòtic, the latter of which is perfect for on the foot exploring. The winding pedestrian streets of the Barri Gòtic, or Gothic Quarter, remind me of Venice, albeit it without the water. The twists and turns hide many little gems including the incredibly welcoming, bustling ‘Set De Gòtic’ Spanish restaurant. We stumbled across this absolute find by accident, and I strongly urge you to have the same accident! Lunchtime found it predominantly full of locals with a scattering of tourists and, after a very warm welcome, we squeezed onto a table in the bar area and enjoyed an excellent meal. You’re probably looking at an average of about 5€ per tapas, although some are a little higher, and 3.50€ for an all important glass of wine or prosecco. It’s not the cheapest lunch we’ve ever had but it was certainly one of the most enjoyable! I was told by the locals they do an incredible paella as well if you’re that way inclined. After lunch a leisurely walk down the rest of La Rambla brought us to the Columbus monument. The great explorer sits atop a 60 metre column in all his glory pointing out to the New Americas, but to be honest the best sights are not to be had from the outside. At the base of the monument is a visitor centre where you can grab your 6€ ticket to the top (we chose the 8€ one where you get a glass of wine on return to terra firma…of course we did!) and head off for the lift. Once up there you get great 360 degree views of the city, including the Sagrada Família which we elected not to climb. We felt the queues and time it would take out of our weekend were not worth it on this occasion. Plus it’s nice to actually see it in your city wide vista! Both bus routes pick up close to the monument so the option is there should you wish to get back on, but how often do you get to walk along a beach in a city? Walking around the marina is an experience in itself, we picked a couple of the yachts out as potential purchases, and if you follow the edges of this millionaire’s hangout you eventually get to the beach. Even though it was January and not exactly bikini weather, the beach is fantastic. As you stroll down the palm tree decorated promenade it’s hard to believe that you’re in a bustling city with over 1.6 million other people. After a decent walk we were ready to quench our thirst, and where better to do it than an ice bar?! IceBarcelona sits right on the beachfront and while it is a little bit of a tourist gimmick we had a cracking time. This may or may not to be to do with the fact that they were playing Beyonce’s entire back catalogue and my girlfriend is a huge fan! It’s about 16€ each (discounts with your bus ticket) and that includes one drink. Once your inside in your eskimo like jacket you will find a bar, a number of ice sculptures including an unbelievable Sagrada Familia, and plenty of like minded people up for a dance! You’ll probably only stay for 30mins max and it’s not the most frugal half hour of your life but we found it was a good way to finish off our day. 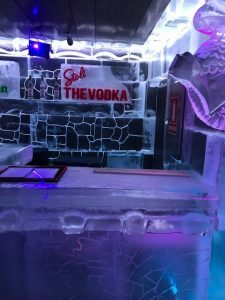 Having picked up the bus from next to the ice bar, we headed back to the hotel to get sorted. Now Spain is great when it comes to eating out. You can have an action packed day, head back and regather yourself, before going out for dinner as late as you want. Our choice for the evening involved grabbing a metro from Passeig De Gràcia, switching onto Line 3 at Paral-lel and upto Poble Sec. The metro system is brilliant in Barcelona and definitely the best way to reach some of the slightly further destinations. We were heading for a street named Carer De Blai, or Tapas street as it is often known. Guess what goes on down there! For tapas lovers like ourselves it is an absolute goldmine of wonderful appetiser-sized Spanish delicacies. 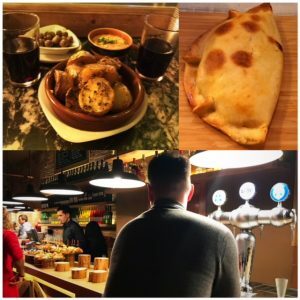 History hats on…here’s why we do Tapas wrong in the UK. The literal meaning for the word “tapa” is “cover or “coaster.” Back in the day the Spanish would use a tapa to cover their red wine in order to stop the flies getting in and necking it, the greedy little swines. At the same time the King of Spain, Alfonso X el Sabio, passed a law that required all bars to serve a small amount of food with every drink in order to prevent drunkenness. What an absolute hero! Why has this law not been passed by our monarch?!?! The food, such as chorizo, olives, or a piece of tortilla (spanish omelette containing garlic and potato…yes it is as good as it sounds!) was placed on top of the coaster and eventually became known as Tapas. It was never intended to be eaten as a full meal so throw away your UK ideals and embrace the culture of the locals. best experience was hopping from bar to bar and ordering one or two tapas with our glasses of red. We enjoyed everywhere we went although there were definitely a couple of highlights in the form of the chicken empanadas in ‘Rekons’, and the cramped individuality of another small restaurant covered in newspapers and random memorabilia. Here the waiter had to perform acts of contortion to get around the tables and annoyingly the name evades me. We were a few wines deep at this point! On top of what we would call regular tapas you will come across many restaurants that serve ‘pintxos’, small dishes held together with a cocktail stick. If you find yourself in one such establishment don’t panic! Just help yourself, keep your sticks, and pay for them at the bar at then end. Exactly like a sushi restaurant but instead of coloured plates you have coloured sticks. Most pintxos cost around 1-2€ and the bigger tapas dishes obviously vary depending on your choice, but trust me you will not go hungry! After a leisurely get up the next morning, Spanish red has a habit of causing this, we made our way back to Casa de Batiló and picked up the Hop On Hop Off orange line. This allowed us to see the rest of the city and includes a winding route up through the Parc De Montjuïc to some of the best vantage points. You can get off at a number of stops, including the Olympic Stadium, and get great pictures looking out across the skyline. Back on the bus again and you will head past the Plaça De Espanya and the Camp Nou. On this occasion we elected not to have a tour of FC Barcelona’s impressive home ground (I’d already dragged my girlfriend around the Bernabéu stadium in Madrid last year) but the experience is much more than just a football ground should you choose to do it. Adults are 25€, although again there is a discount with your bus ticket. eating. Be aware that on a Sunday many shops are closed so you may struggle to quench your retail thirst. 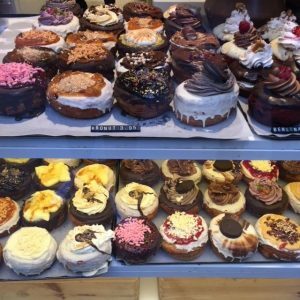 One place that was open was ‘Chok – The Chocolate Kitchen’ on Carrer de Carme and I discovered the incredible joy that can be had from eating a cronut, a croissant donut pastry that comes in all manner of flavours. It’s one not to be missed. Once home time beckons, the train back out from Passeig de Gràcia was again the easiest option. 48 (and a bit) hours done. The great thing about Barcelona is it perfectly fits the old cliché of having something for everyone. No two trips will ever be the same and while you should in no way aim to follow our meandering adventures word for word, I do hope you find something useful…even if it just pushes you into going to this beautiful city!